Dun Studbook: mares & stallions - must have 2 registered parents. Proof must be provided. Must PASS conformation standards. Dun Non-studbookmares & stallions - either one or both parents are unknown / unregistered / unproveable. Must PASS conformation standards. These horses have full showing rights. Dun Gelding Register: geldings - may have either registered or unknown / unregistered / unproveable parentage. Must PASS conformation standards. Must be a genetic dun. Genetic buckskins which exhibit dun characteristics will not be eligible for registration as duns but will be registered as buckskins. Be permitted white markings on the face and legs only, the legs not to be white above the knees or hocks save for a continuous diminishing spear or stripe running above the knee or hock. NO dun may have ANY white markings (ie belly splashes) other than those permitted under the Regulations of the Company. Notwithstanding this, an owner may apply to have a horse or pony accepted for registration under the company's hardship clause which allows for small amounts of underbelly white..
New research reveals why some horses exhibit strong dun factors but are not genetic duns! The family of duns generally fall into four (4) categories: GRULLA (black/dun), BROWN (brown/dun), BAY (bay/dun) and RED (chestnut/dun). There are sample photos of the various dun colours here. GRULLA - Grulla (pronounced Grew-yah) is considered an intense colour. The body colour is described as mouse, blue, dover, or slate coloured with dark sepia to black points. Grulla has no white hairs mixed in the body hairs. The hide of a Grulla is comparable to the hide of the Dun and is well pigmented to withstand heat and sunlight. Grulla horses have a dorsal stripe and in most cases shoulder stripe and leg barring. Grulla should not be confused with roan or grey colours. BROWN (Mouse) DUN – A mouse dun is often a muddy brown or tan colour with a muddy brown face mask and primitive markings. BAY (Yellow) DUN - The yellow dun varies in colour from pale cream to orange/brown. Yellow dun differs from the Buckskin in the respect that the body colour is a duller shade and often will have a smutty appearance. The yellow dun has a very prominent dorsal stripe and usually has a shoulder stripe and leg barring. 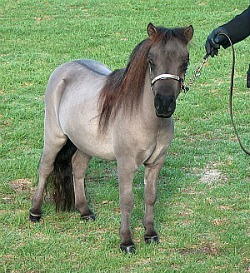 Legs, mane and tail are brown or black with frosting and guard hairs being common. RED DUN - The red dun will vary in body shades of red, from peach to copper through to rich red and liver. In all shades, the accompanying points will be a darker red or chestnut and be in contrast to a lighter body colour. Red dun must have a definite dorsal stripe. The dorsal stripe will usually be dark red and predominant. Leg barring and shoulder stripes are common. Horses with faint dorsal stripes may be denied registration. BUCKSKIN DUN – one copy of cream on bay/brown + dun; the lightest shades are sometimes called ‘seal-point’ duns. These horses can be virtually indistinguishable from yellow duns and may only be ‘discovered’ by a check of their pedigree or from the production of common dilute progeny from base coloured or non-common dilute partners. PALOMINO DUN – one copy of cream on chestnut + dun. Palomino duns can vary in colour from pale straw right through to yellow gold and they generally have gold or tan dun markings. PERLINO DUN – two copies of cream on black, brown or bay + dun. SILVER GRULLA – silver + dun on black. BUCKSKIN SILVER DUN – one copy of cream, silver & dun on black, brown or bay.